Originally seen on the Londonist. A bus reflected in an Oxford Street Christmas display. Photo: Jon Spence. 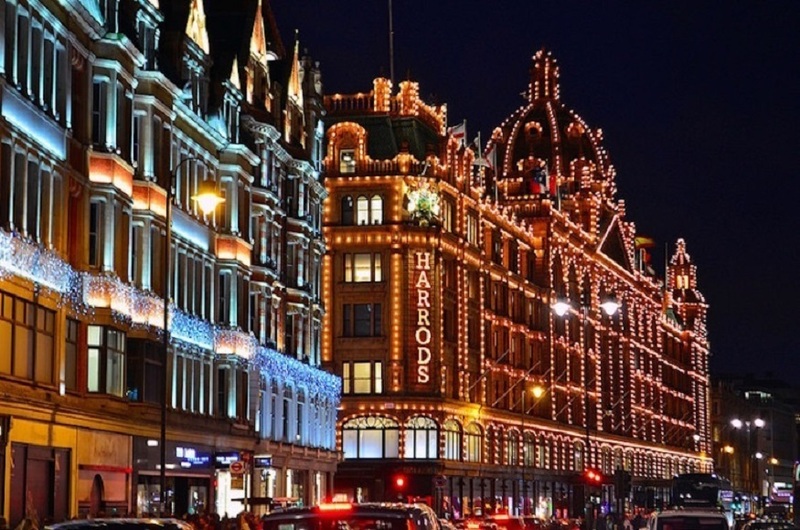 With so many Christmas lights to ogle (and windows to marvel) in London, how’s it possible to tick them all off in one fell swoop? The answer: by bus. £1.50 buys you a tour around the city’s best festive sights — from the comfort of a double-decker. Here, we tell you the three key routes. Why not pack a few mince pies and a flask of mulled something for the ride. Embark at High Street Kensington station: the route will take you past Kensington Palace then via the Royal Albert Hall. 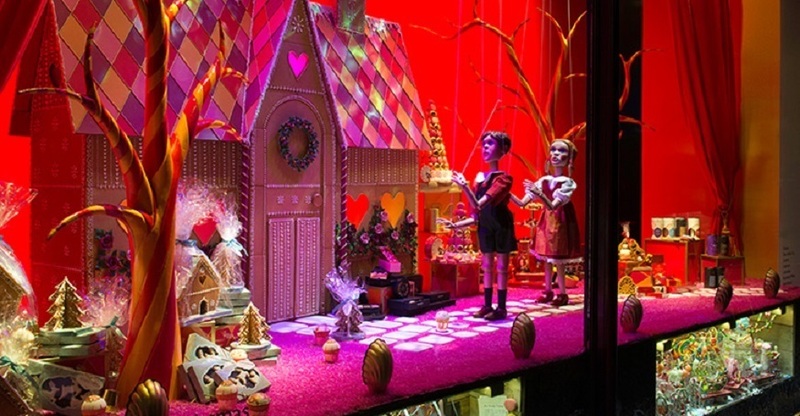 Next you’ll be able to admire Harrods and their legendary window displays — this year’s ‘Once Upon a Christmas’ is based on fairy tales. After Marble Arch, a drive down Oxford Street allows you to see the snowball-esque lighting (this year were switched on by the one and only Craig David). Keep your eyes peeled as you head along the road; Selfridges’ campaign is called ‘Shine On’, and features Santa in a variety of unlikely scenes and settings — in a train carriage, on a ski lift, and in… a hot-tub. John Lewis is next on the agenda (another shop famed for its festive displays). The bus then heads to Tottenham Court Road (strung up with more lights) and past the British Museum. The St Pancras Renaissance Hotel might remind you of an ostentatious gingerbread house, before you arrive at the final stop, King’s Cross station. Hop on the 23 at Portobello Road, and begin to meander through some posh parts of the city: Westbourne Grove should have some quirky displays from the upmarket boutiques. 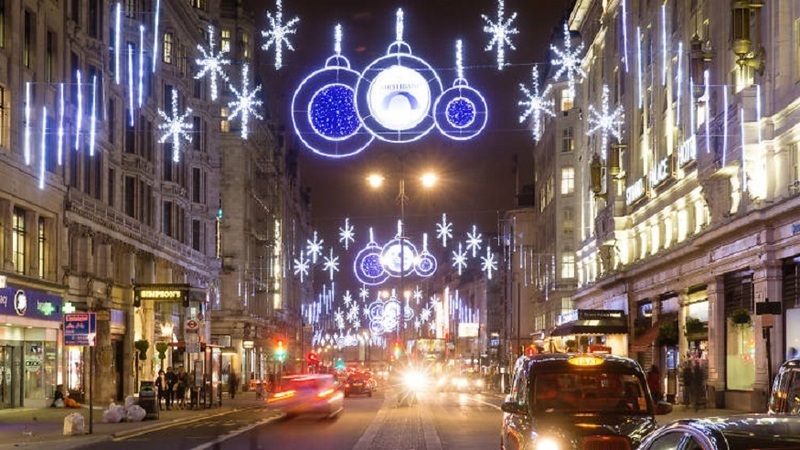 After Paddington station and Marble Arch, the bus will take you down Oxford Street, to witness lights aplenty and some impressive window displays (see above). 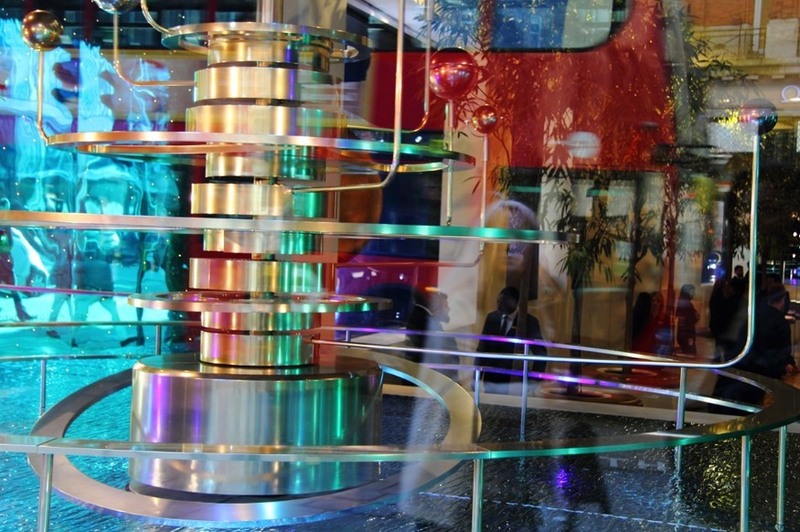 Your inner child will get pretty excited as you move down Regent’s Street and pass the toy kingdom that is Hamleys. The route then heads to Piccadilly Circus, which will be even more glowing than usual (look out for festive Coca-Cola ads). 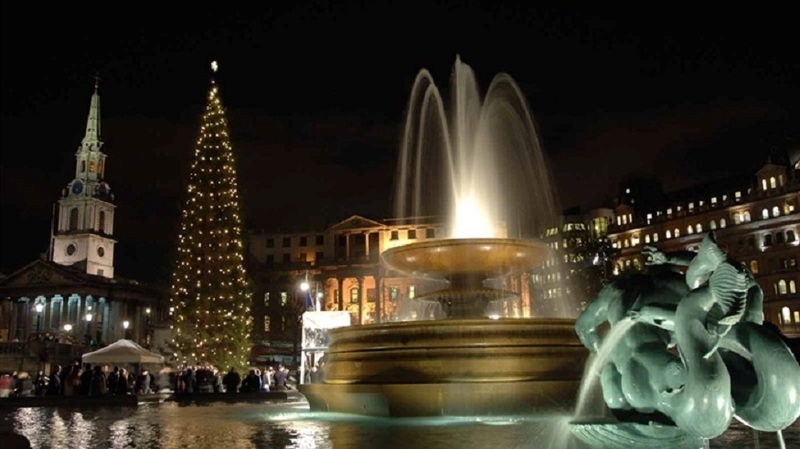 It wouldn’t be Christmas in London without a gander at the huge tree in Trafalgar Square, which is next on the agenda: throughout the festive period, there’ll be various events and carol singing taking place under said tree. You can even pencil in your ride for 1 December, when the Christmas tree lights are officially switched on. 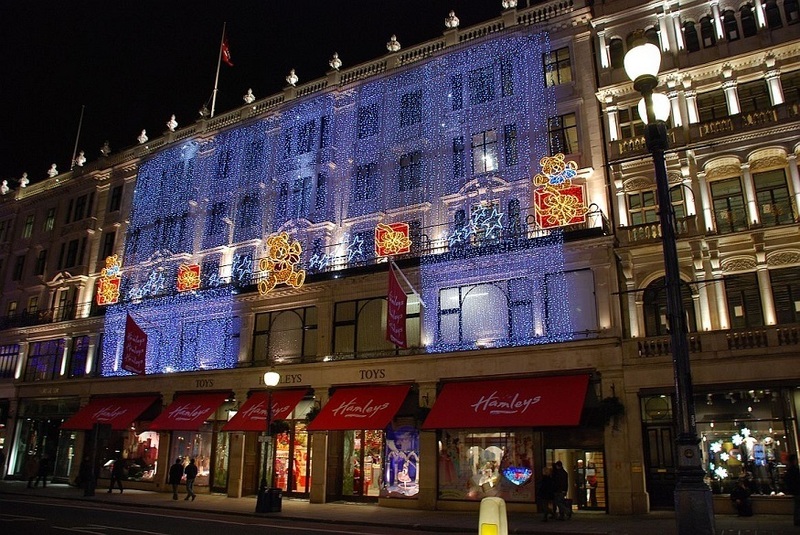 The Strand always puts up an impressive display when it comes to Christmas lights, and this year is no exception. These lights are the greenest in London — powered by biofuel from recycled oil from the city’s restaurants. Finish up at Liverpool Street after touring past St Paul’s and feeling like a very festive tourist. 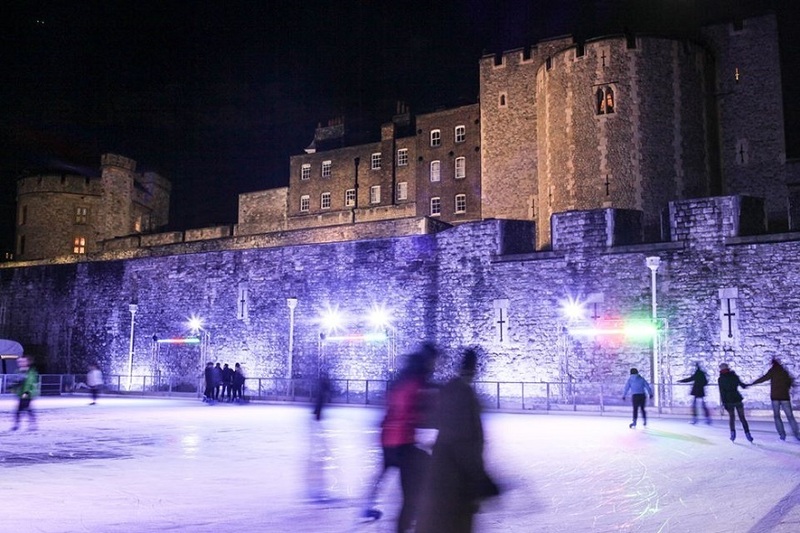 Jump on the RV1 at Tower Gateway, where the bus will whisk you on a tour past the Tower of London and its Christmassy ice rink. 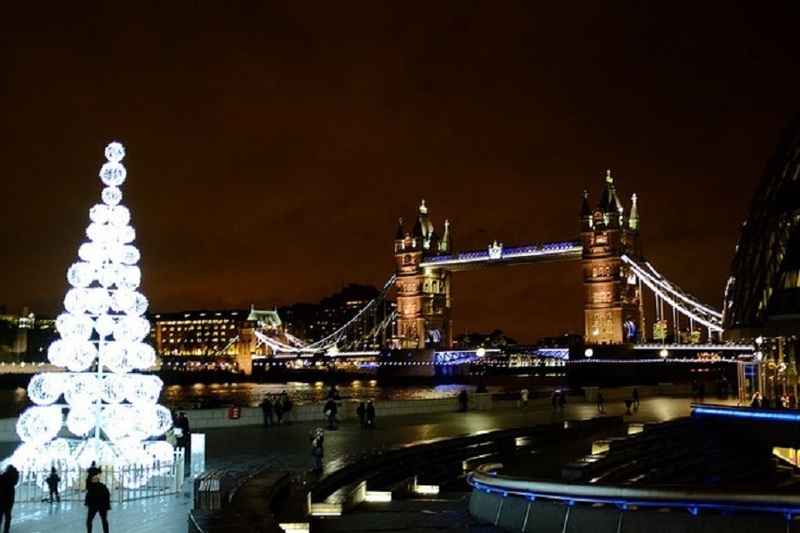 You’ll then head over London Bridge, where you’ll see More London’s festivities — each year there is a Christmas market with wooden huts selling everything from mulled wine to baubles. You might even be able to smell it out the bus window. Crossing Waterloo Bridge will allow you to witness the London Eye (and another ice rink) , before taking in Somerset House. Ending in Covent Garden, here’s the perfect opportunity to hop off and see the market’s decorations and stock up on a few presents. As well as the market itself having stunning decorations, the whole of the piazza and the nearby Seven Dials will be adorned with all things festive. This year, the theme is mistletoe (just watch out who’s standing near if you’re right underneath). Warm? Check. Cheap? Check. All of the lights? Check. You’ve had yourself a thrifty little Christmas.